← Shriley J. Mills, Ph.D.
SUGAR LAND, TX, March 18, 2013, Stephanie Plain Potter, M.Ed., MA, School Counselor and Special Program Coordinator for Wessendorff Middle School and the Lamar Consolidated Independent School District, has been recognized by Elite American Educators for dedication, achievements, and leadership in counseling and teaching. An expert in counseling and teaching, Ms. Plain Potter meticulously oversees 504 students, including English as a Second Language and Limited English Proficiency students. She is also in charge of at-risk coordination, conducting individual and group counseling and data assessment, managing curriculum and instruction, and analyzing student performance. Ms. Plain Potter is currently an adjunct professor at DeVry University, where she teaches composition, advanced composition, and professional writing. Ms. Plain Potter speaks nationally on the topic of “Making Parents Allies” and “Bridging the Gap, Intervention vs. Prevention.” Ms. Plain Potter has written two books, entitled “God’s Touch” (2012), and “God’s Kiss” (2013). Both are available at amazon.com, Barnes and Noble, smashwords.com and goodreads.com. Ms. Plain Potter has garnered a reputation of distinction over the course of an illustrious career, which spans more than 15 years, and she continues to strive for excellence in her every endeavor. She pinpoints the most gratifying aspect of her career as interacting with and counseling students, as she is proud to be able to make a positive impact on the lives of others. Inspired by a love of education and psychology, she pursued her current career path with dreams of helping people and making the most of her abilities to remain active in her undertakings with regards to counseling. A Certified Lifetime National Teacher, Counselor and Principal, Ms. Plain Potter belongs to the Texas Counseling Association, the National Mental Health Association, and the National Christian Counselors Association—an organization for which she serves as a National Love and Logic Facilitator. 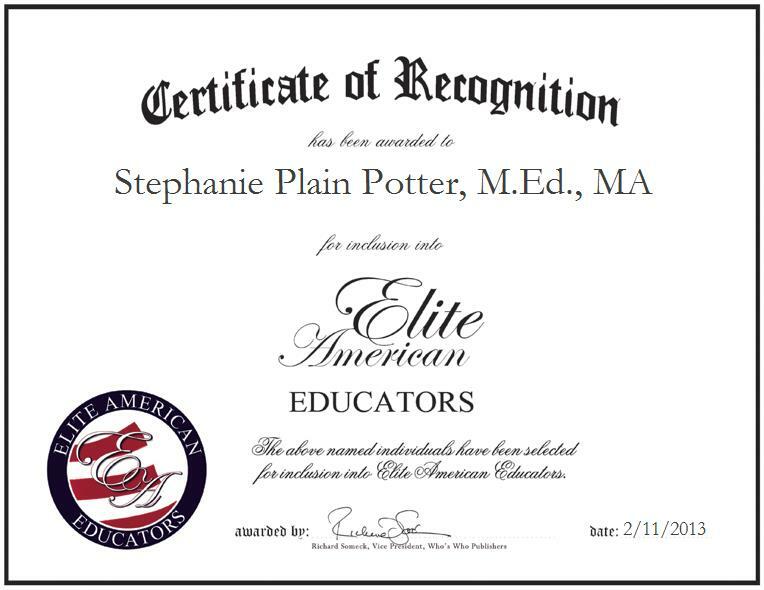 To learn more about Stephanie Plain Potter, please visit http://www.stephanieplainpotter.com.